Your Ladakh motorbiking adventure starts in the city of Leh. From here, you'll make excursions to visit popular destinations in the valley, including Buddhist monuments like the Shanti Stupa and the high-altitude mountain pass of Khardung-La. You'll spend a night in the Nubra Valley, known for its cold deserts and double-humped camels, and a night by the Pangong Lake, a multi-coloured lake spanning India and China. At the end of these 6 days, Leh will be a part of you forever. • Explore the Leh landscape on powerful Royal Enfield motorbikes. 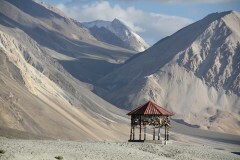 • Visit Ladakhi landmarks like Nubra Valley, Pangong Lake, and Khardung-La. 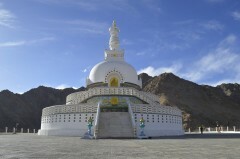 • Visit the Shanti Stupa, Pathar Sahib Gurudwara, confluence of Zanskar-Indus. Any damage to the motorbike and helmet during the tour will be deducted from the security deposit paid at the start of the trip. Any damanges over and above the deposit will be borne by the traveller. Travellers are required to follow instructions of the road captain during this Leh motorbiking trip. 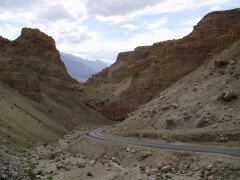 For cancellations made 45 days or more before departure date of the Leh motorbiking trip: 75% refund. For cancellations made 30-44 days before departure date of the Leh motorbiking trip: 50% refund. For cancellations made less than 30 days before departure date of the Leh motorbiking trip: no refund. The tour operator reserves the right to alter or cancel the itinerary of this Leh motorbiking trip due to any unforeseen circumstances to ensure maximum safety of travellers and staff. Costs arising due to such a change in itinerary are borne by the traveller. The tour operator takes utmost care to ensure maximum safety for travellers and will not be responsible for any accident, mishap or loss of life during the Leh motorbiking trip. Wake up to a lazy morning in Leh. You'll check-out of the hotel by late morning. Your trip ends here. You'll be accommodated in clean and comfortable hotel rooms in Leh. Couples will be allocated rooms on a twin-sharing basis, while larger groups will be allocated rooms on a triple-sharing basis. Today's meal package includes dinner only, but you may visit any of the restaurants in Leh to have extra meals or order from the hotel itself at your own expense. Try to spend your day doing short walks, drinking plenty of fluids, and getting some fresh air so that you acclimatise faster. 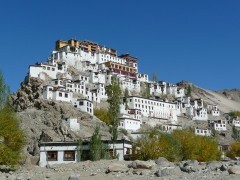 Test ride your motorbikes and visit popular monuments around Leh. You'll be accommodated in a hotel at Leh. Today's meal package includes breakfast and dinner only, but you may visit any of the restaurants in Leh to have extra meals or order from the hotel itself at your own expense. Breakfast and dinner will be served buffet-style in common dining areas of the hotel. Ride your motorbikes from Leh to Nubra Valley via the Khardung-La pass. This is when you start to feel even more connected to the Ladakhi landscape when you can hear all its sounds as you fall asleep. You'll be accommodated in deluxe tents with an attached washroom in the Nubra Valley. Today's meal package includes breakfast and dinner only, but you may stop at restaurants and eateries en route to Nubra Valley to have extra meals at your own expense. Ride your motorbikes from Nubra Valley to Pangong Lake. Stargazing in the night sky above the lake is an experience you'll never forget. You'll be accommodated in Swiss tents with attached washrooms beside the lake. Today's meal package includes breakfast and dinner only, but you may stop at restaurants and eateries en route to Pangong Lake to have extra meals at your own expense. Ride your motorbikes from Pangong Lake to Leh. En route, visit monuments and places of attraction. You'll be accommodated You'll be accommodated in a hotel at Leh. Today's meal package includes breakfast and dinner only, but you may stop at restaurants and eateries en route to Leh to have meals at your own expense. Depart by late morning. Today's meal package includes breakfast only. You'll check-out of the hotel after breakfast. Your trip ends here. 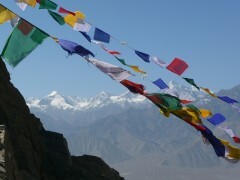 The easiest way to get to Leh is by flight from major hubs in India. The hotel's address will be shared with the participant after booking confirmation.